Glaciers in the Himalayas, which store large amounts of water in the form of glacial ice, have an intricate relationship with climate change. A new study in an important basin in the Indian Himalayas shows that low-altitude glaciers are more sensitive to climate change and have lost a significant amount of water in the past three decades. 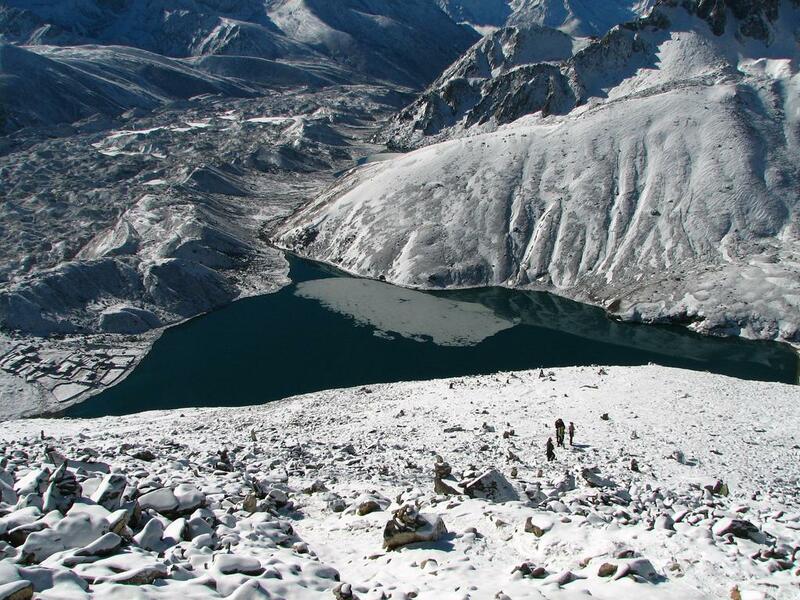 An understanding of fresh water stored in the Himalayas is crucial for water resource management in the region, but it has been difficult to estimate the amounts of water stored in these glaciers. Researchers have now used a new technique to estimate mass of glaciers and a new model to estimate the volume loss over a long period. It combines satellite data of snowlines, a temperature-index melt model and the accumulation-area ratio method to estimate annual mass balance of glaciers in the basin as a whole. The total surface area of the selected glaciers is about 660 square kilometers. The total ice volume estimated for these glaciers is 62 gigatonnes (with a margin of ± 16 gigatonnes). In total, the Chandra basin has experienced a water loss of 11.1 gigatonnes (with margin of ± 8 gigatonnes) from 1984 to 2012, which is about one-fifth of the total estimated volume. The study, which covered 146 glaciers in the Chandra basin in western Himalayas, shows that these glaciers as a whole have lost 19 percent of the total basin volume during the period from 1984 to 2012. However, the loss of volume for small and low-altitude glaciers in the basin is as high as 67 percent in the same period. “This is the first time, not only in India but globally, that we have an estimate of how much volume and mass of glaciers has been lost over a period of time in a large basin. This is the first reliable estimate of both how much water is stored and how much has been lost in the past 30 years,” Anil V Kulkarni, professor at the Divecha Centre for Climate Change, Indian Institute of Science, Bangalore, who led the research team, told India Science Wire. The findings of the research have been published this week in journal Annals of Glaciology. The research team also included Sayli Atul Tawde of Center for Atmospheric and Oceanic Sciences and Govindasamy Bala of Interdisciplinary Centre for Water Research at IISc. Data about daily minimum, maximum air temperature and snowfall from 1984 to 2012 was obtained from Kaza weather station, located about 25 kilometers from the basin boundary. Other data such as temperature lapse rates and snow densities for calculating melt factors were are obtained the Patseo observatory of Snow Avalanche and Study Establishment. Dr Kulkarni said the loss of volume in low-altitude glaciers seen was substantial and it suggested that small villages located in this valley might experience water scarcity because mountain communities depend on water supplies from low-altitude glaciers. The new findings are consistent with other studies on Himalayan glaciers which report that high altitude glaciers are not losing ice and some of them like Karakoram are growing. “The glaciers in Chandra basin have a large amount of water stored in them and they are not in danger of vanishing anytime soon. But small and medium sized glaciers situated in the lower altitudes of this basin have lost almost 70 percent of their volume in the last 30 years,” Dr Kulkarni explained. This is important because most of the communities are not living along the big glaciers but along the small ones as weather is more conducive. Temperature is an influencing factor and there has not been a change in the pattern of snowfall or precipitation. It was in the 1980s that the temperature started to rise, leading to melting of some glaciers. The mass loss has gone up in last decade and this is consistent with the rise in temperature. The study also measured sensitivity of Chandra basin glaciers to temperature rise. “Sensitivity analysis suggests that a 20% increase in snowfall can offset changes in mass balance for a 1 degree temperature rise,” the study says.